Crimson Trace LG-404, LG-304 Laser Grips for 1911 Compact FREE SHIPPING! 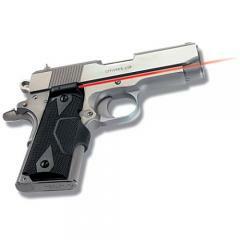 These Laser Grips from Crimson Trace fit 1911 and 1991A1 Officer's Compact and Defender single-stack handguns. They are constructed from durable polymer with a wrap-around rubber over-mold pressure switch. Two models are available, the LG-404 with front switch and the LG-304 with dual side button activation. Both options feature Crimson Trace's signature Instinctive Activation technology, which activates the laser when the firearm is held in a standard shooting grip, providing enhanced accuracy from the moment that it clears the holster. The grip also includes a master on/off switch for instances when firing without a laser is preferred. The Class IIIa red laser has a peak output of 5-milliWatts, the maximum allowed under federal law, providing high visibility for accurate shooting in most lighting conditions. It is factory-sighted at 50-feet and includes user-adjustable windage and elevation settings for greater accuracy. ©2002-2019 CopsPlus.com: Crimson Trace LG-404, LG-304 Laser Grips for 1911 Compact FREE SHIPPING!